Anti-fascist self-learning workshop, through the Bishopsgate Institute's Archive with the Aesthetics of Resistance reading group. Anti-fascist self-learning workshop, through the Bishopsgate Institute’s archive with the Aesthetics of Resistance reading group. 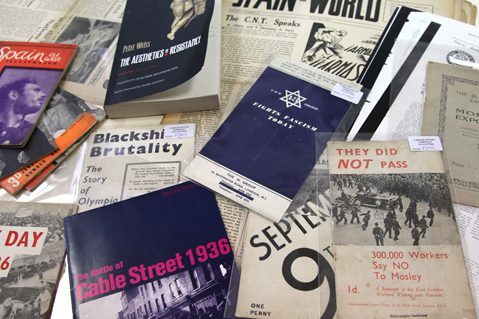 This is a self-learning workshop, where a selection of material related to the history of resistance to fascism in Britain, from the Bishopsgate Institute’s archive will be brought to the table, to peruse, select, read and discuss together. Workshop attendees are also invited to bring with them related material. 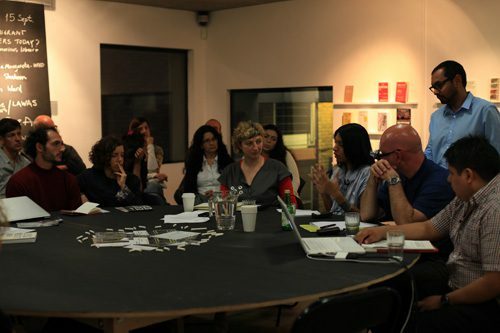 The Aesthetics of Resistance reading group was founded by The Museum of non-participation. The group have been meeting regularly for the past year at Bishopsgate library. Collectively they read the book with the same title by Peter Weiss, a monumental, complex novel of historical events taking place in Europe with the fall of the Weimar republic which functions at the same time as a manual for anti-fascist self-education. We’d like to encourage those who would like to contribute the material to the workshop, that is in a digital format, to come half an hour prior to the start of event. Thank you. This session is followed by the Anti-fascist Footprints guided walking tour, led by David Rosenberg (this must be booked separately). Inspired by Iniva’s three-year project At the Intersection: Art & Economies.